How do I get Wholesale Travel Deals? Where better deals are made for YOU! Wholesale Hotels Group - Your go-to place for wholesale travel deals! There were only two ways to make reservations at a hotel not too long ago but nobody was able to access wholesale travel deals unless you worked in the industry and had the backdoor access to those channels. You could walk into a hotel and book a room. You could use the services of a travel agent to do the same. Some hospitality companies had their own network of representatives at strategically placed travel desks. You could make reservations at airports and other prominent places. With the emergence of online travel sites, the role of traditional travel agents or reservation services has been completely redefined. The online reservation websites are your travel agents these days. However, they do not offer you the best prices at all times. Not by far! Many websites proudly present themselves as aggregators. They allow you to compare tariffs at the same hotel. Many boast of the fact that you can compare the tariffs of the same rooms at the same hotels before making a decision. Such information should help you to get the best accommodation at the cheapest price wherever you go and whichever property you choose. That is definitely not what the reality is. You would notice that most aggregator websites today have similar prices. They can be off by a few bucks or be identical. You are not really getting any exclusive access to some amazing deals. You may be getting a modest discount on the rack rate. Hotels have even stopped publishing rack rates in many regions, simply because they do not get any walk-ins anyway. They have presented their online rates in a manner that you would get a discount and presume you are making some savings. In the end, those online “discounts” are nothing more than just regular rates that the hotels have already factored in. Are any of them considered wholesale hotel rates? I hardly think so! Where are the REAL savings then? If you are looking for actual savings when you stay at a hotel, you ought to look for wholesale travel deals. The wholesale hotel prices are not the same as an online discount or you comparing two reservation portals and assuming a saving by choosing a better offer. Wholesale travel deals are a one of a kind proposition wherein you get access to a price that aggregator websites, travel companies and even the official website of a hotel you choose would not offer. Wholesale Hotel Group allows you access to truly amazing, WHOLESALE hotel rates through its network. These wholesale travel deals are available to individual travelers, for pleasure or business for as low as $4.99 for a 7-day membership for a LIMITED TIME ONLY! They are also available for corporations, travel agents, nonprofits and government entities among others and the platform access is 100% FREE! If you are an individual user, looking to access wholesale travel deals, just click on the picture below and SIGN UP NOW! Travel Professionals, Non-Profit and Government entities: Go to www.WHotelsGroup.com and at the bottom of the page, click on the appropriate field to sign up! 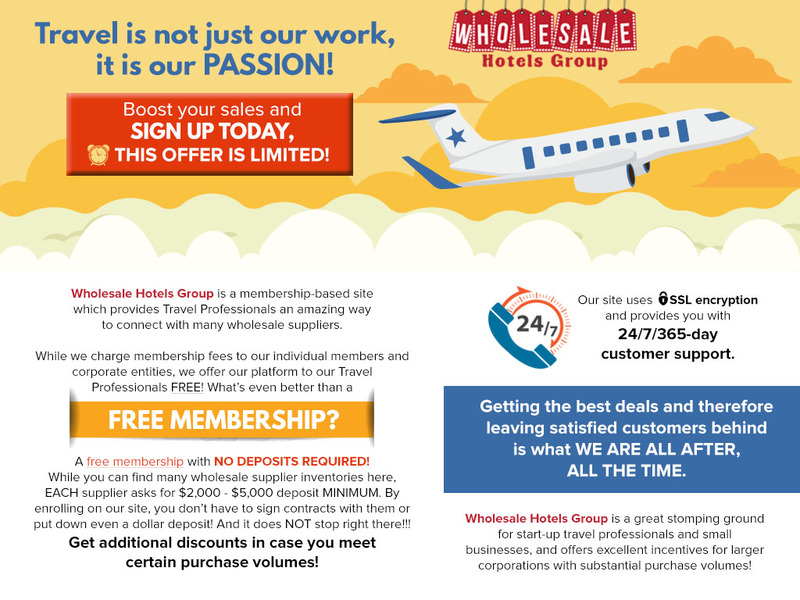 Wholesale Hotels Group – The platform to make wholesale travel deals happen for YOU! © 2019 Wholesale Hotels Group – Blog. Theme by Akila Thiwanka.